Roy had said experts from India would train local staff in areas such as English language, hospitality. 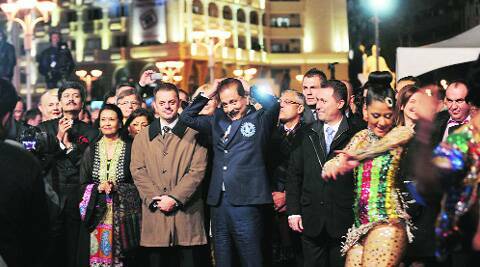 The arrest of Sahara Group chief Subrata Roy has been received with shock and embarrassment in a rather unlikely part of the world — Macedonia. Last year, this small Balkan country of 2 million people located to the north of Greece had laid out the red carpet and welcomed the controversial Indian businessman as a saviour of its weak economy. The Republic of Macedonia has a record unemployment rate of 30 percent, with every third person living in poverty and is eager for foreign investment. And Roy made three trips — in January, July and October 2013 — with his entourage and announced big plans as he rubbed shoulders with Prime Minister Nikola Gruevski and other top government ministers. He said he would invest a whopping 2.7 billion euros in businesses in Macedonia in the next five years, which would include building a ‘Las Vegas’ and bringing 20,000 cows into the country. Roy also argued that fraud and debt allegations against Sahara in India and reports about its financial condition were all fictional and had nothing to do with planned investments in Macedonia. The ‘Sahara India Parivar’, he claimed, was worth 22 billion euros and had one million employees. The Macedonian government presented him as a very human businessman who wants to help the poor because Mother Teresa, who was from the Macedonian region, helped a lot of poor people in India. Macedonians believed Roy’s nice-sounding promises and thought their government had finally found a great investor who would save the Macedonian economy. But news that he has been arrested and sent to jail in an alleged fraud case has come as a shock. “If it’s too good to be true, then probably it isn’t,” has been the first reaction of many people on social media networks. Government officials, who were eager to be photographed with him, have gone silent after he was detained. The Macedonian government had no comment about his arrest and asked reporters to demand answers from Roy’s firm in India. Roy’s office in Skopje said his plans to invest in Macedonia remain despite the new situation. “I love this country and that is why I’m here. I came with a large delegation but there is much work ahead to start. Things grow, and I can say that I’m here with big plans and ambitions, but it takes time,” Roy had said after arriving at the airport in Ohrid in July. Among his announcements was one to build a super-luxury tourist complex called ‘Saharijan Macedonia’ worth hundreds of millions of euros on an area of 240 hectares in Ljubanista village on Lake Ohrid. The complex is to include a luxury hotel by the water, high class apartments, villas, bungalows, private beaches, casinos and golf courses. Roy had also asked for an additional 17 acres of state land to house the staff who would serve the complex. Following a meeting between Roy and his manager and a large government delegation led by Finance Minister Zoran Stavreski, Sahara announced that it would set up a plant in Lozovo that would make dairy products mostly for export to the Middle East and South Africa. The plant would have an investment of 211 million euros, employ about 2,000 people and have 20,000 heads of cattle. Roy also claimed that his company had invested around 10 million euros in Macedonia, partially in the land of hotel Ino Spectar. He said construction activity for Saharijan Macedonia would start sometime in March or April this year and that he would bring labourers from outside to work with locals as Macedonia does not have enough manpower for such a grand project. He also said experts from India would train local staff in areas such as English language, hospitality, gastronomy and other activities linked to the project. In January 2013, he announced that a 32-foot statue of Mother Teresa would be built in the centre of Skopje. In October, he organized the Balkan Peace Festival in Skopje, which opened with fireworks, Indian dancers and music stars and was addressed by Prime Minister Gruevski. In his speech to a half-empty hall, Roy said he had been searching for a country without corruption and had finally found Macedonia. “This idea was growing in me for a long time, I was looking for a city, a country in the world that is full of love, and respect, a country without corruption, and that I found in Macedonia,” Roy had said. Macedonia, incidentally, is ranked 67th on Transparency International’s list of corrupt countries and EU reports emphasise that corruption remains a major problem and a challenge for institutions in Macedonia.